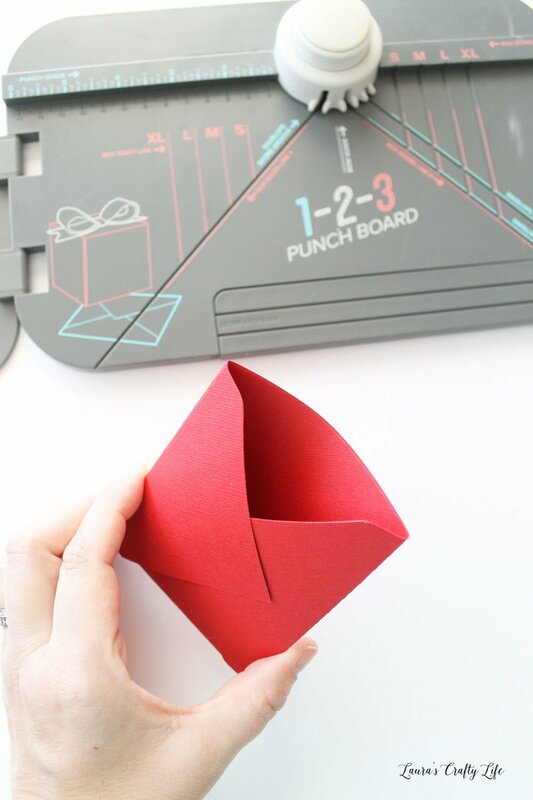 Valentine’s Day Party Favors. 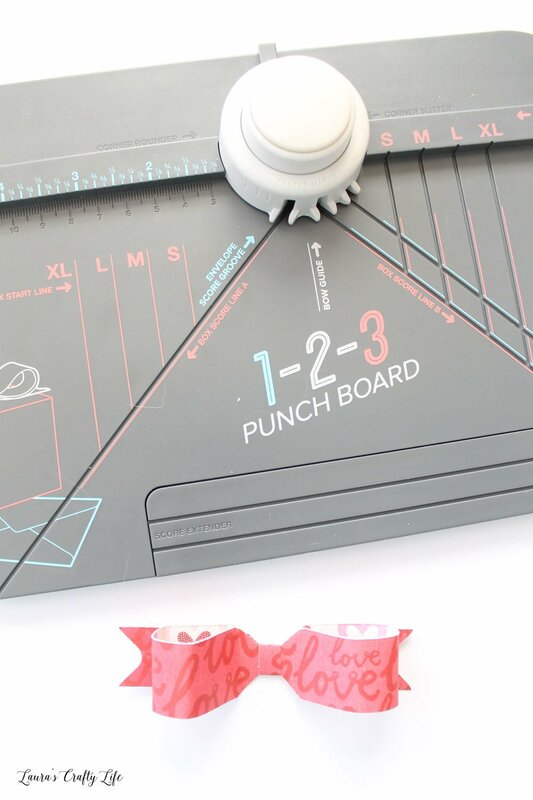 Use the We R Memory Keepers 1-2-3 punch board to create beautiful paper Valentine’s Day favor envelopes. 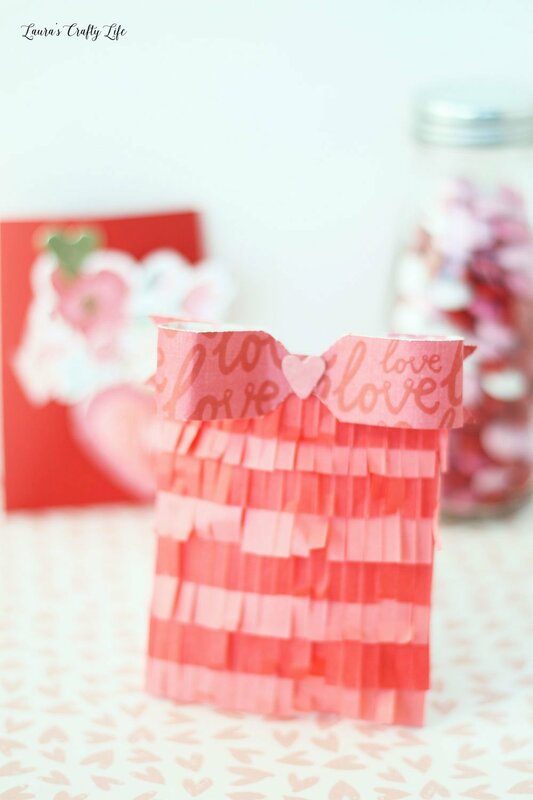 I love to make little favors or treat bags for parties. 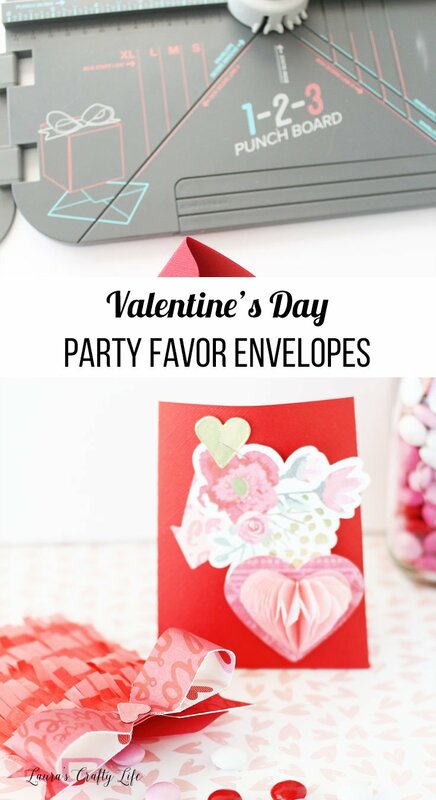 Sometimes I keep it simple, and other times I create more elaborate ones like these Valentine’s Day party favor envelopes. 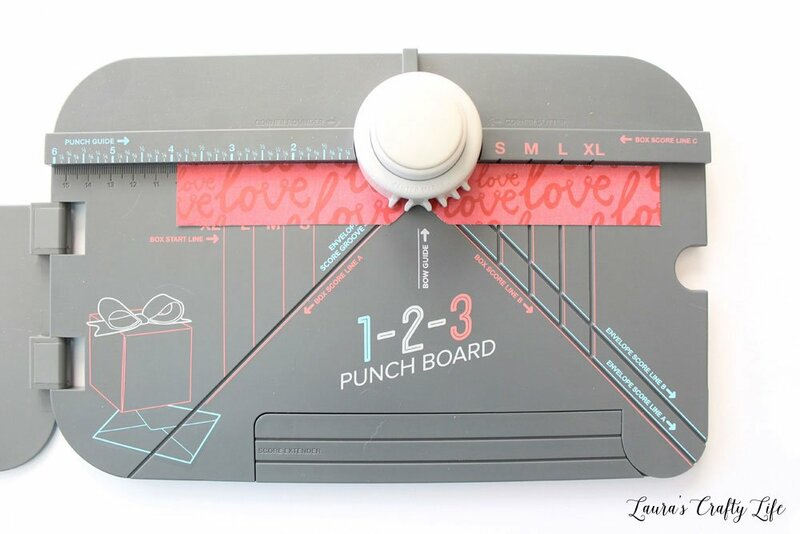 They look complicated, but with the 1-2-3 punch board and DIY party collection honeycomb and fringe pads, they come together easily! I received product and payment for being on the We R Memory Keeper’s Design team. This post originally appeared on the We R Memory Keepers Blog. This post contains affiliate links. If you purchase something through the link, I may receive a small commission at no extra charge to you. Please read my full disclosure policy here. 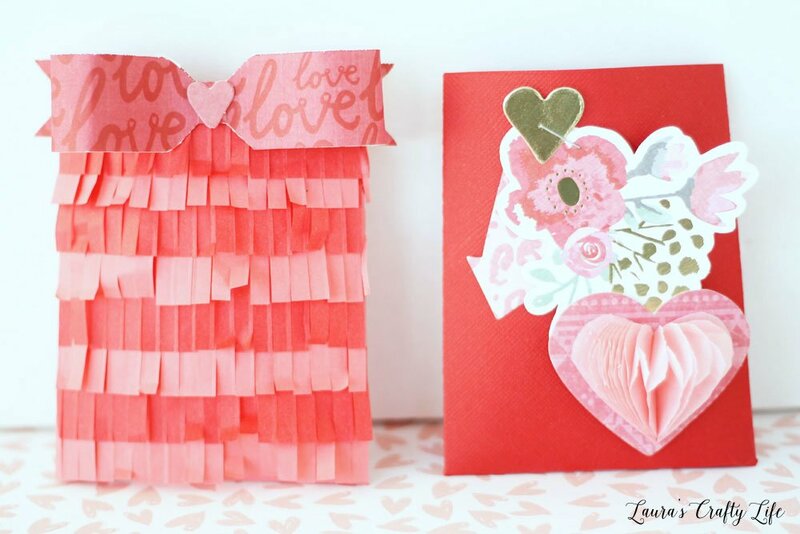 I created a 3” x 4” envelope using the 1-2-3 punch board and red and pink textured cardstock. 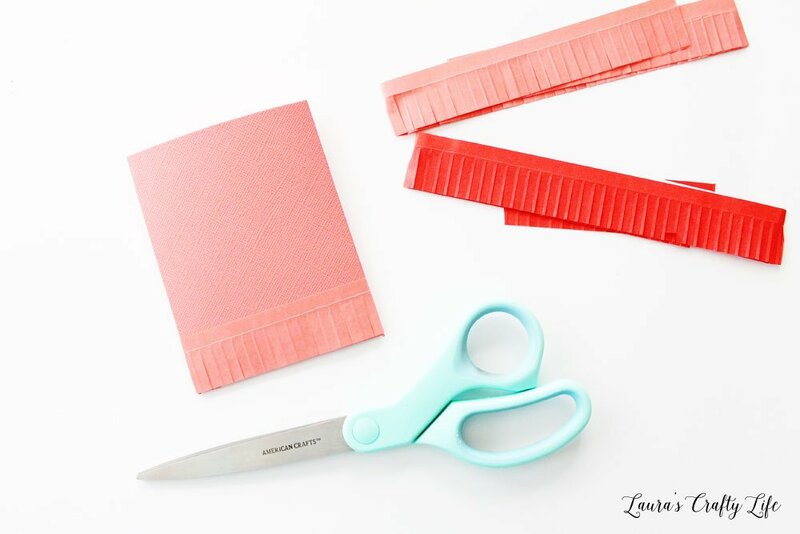 Start by trimming your paper, in this case, a 6 ¼” x 6 ¼” square. 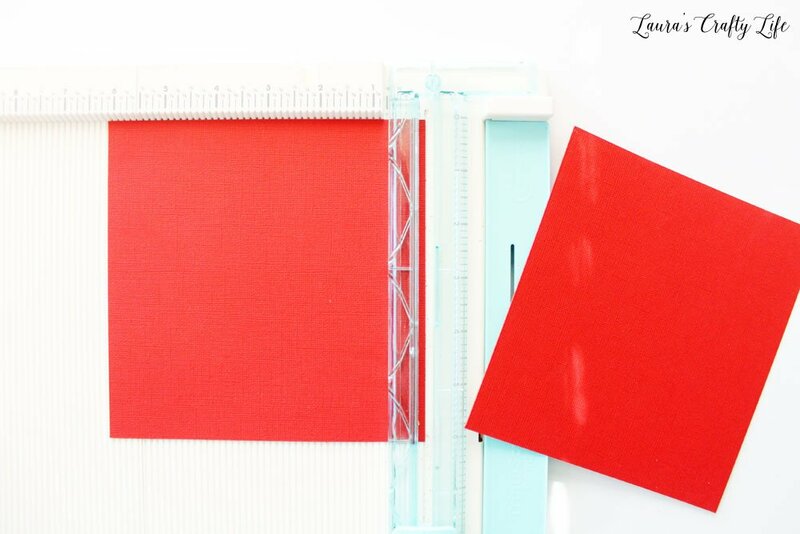 Use the guides on the punch board to find the correct paper size for the envelope you are creating. 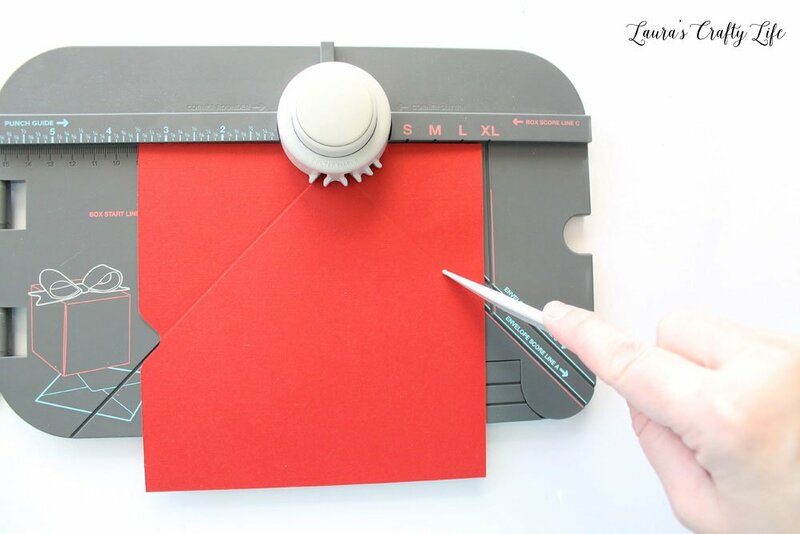 Using the 1-2-3 punch board and the guides, create an envelope. 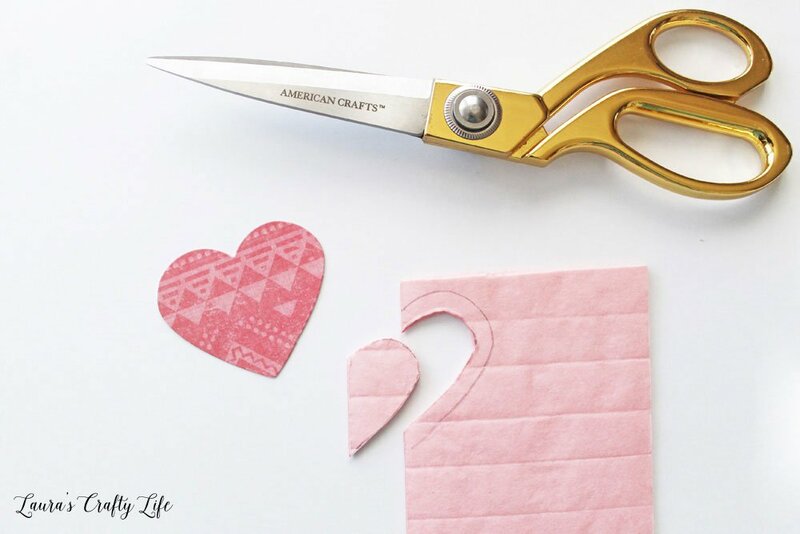 Trim off one of the shorter ends from the envelope. 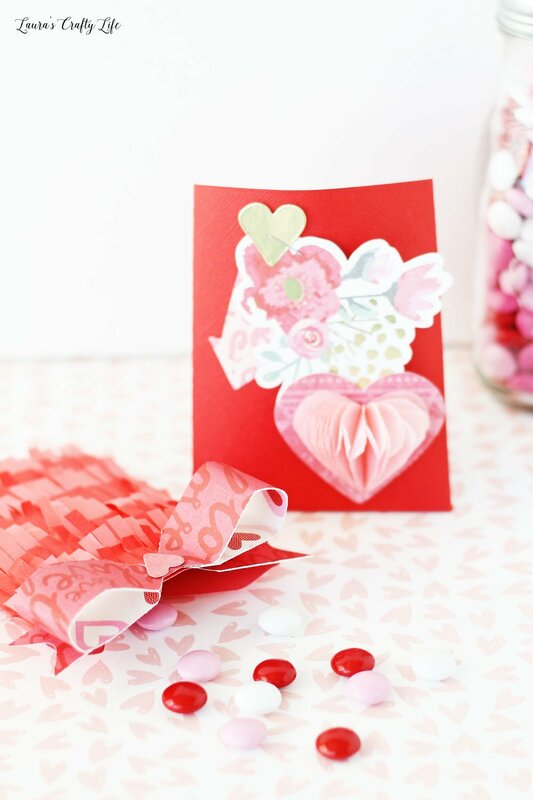 Then, assemble it to create a little goodie bag pocket from your cardstock. 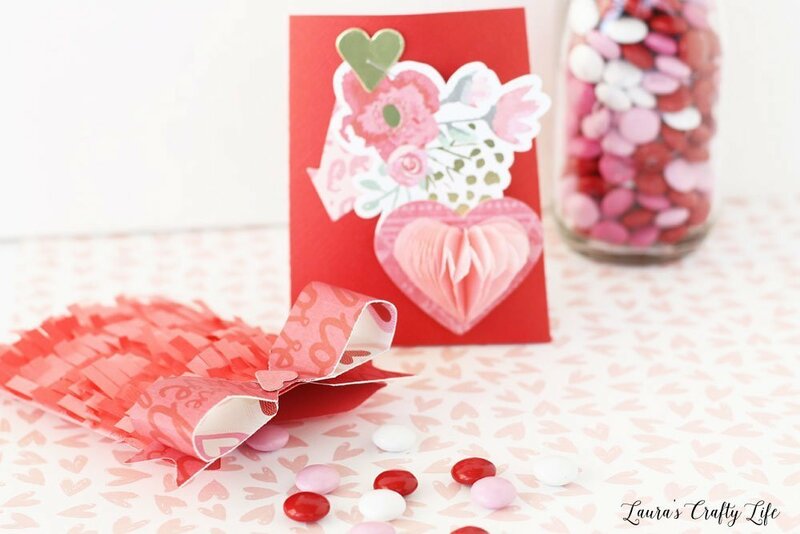 I created both pink and red envelopes that were now ready for embellishing. For the first style of envelope, I added some of the Crush Collection ephemera to the top of the envelope. 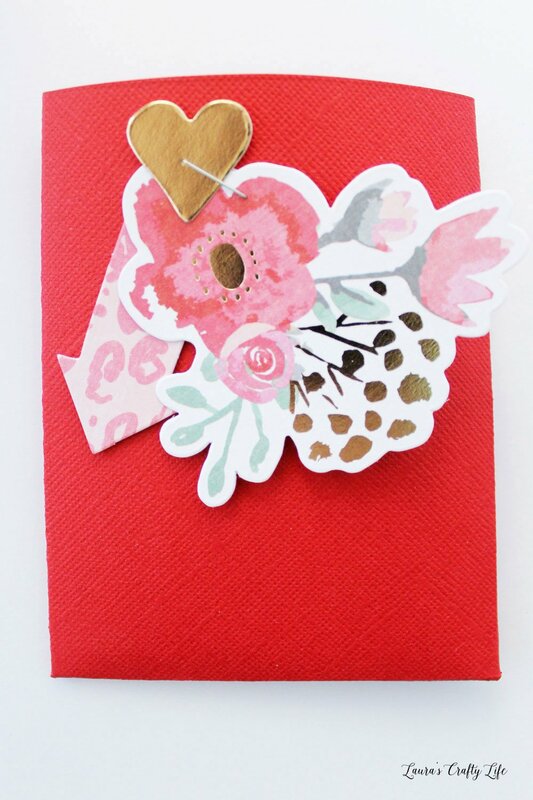 I layered an arrow, a flower, and a gold heart and attached them all with a staple. I wanted to create a little more dimension on the ephemera heart I was adding. 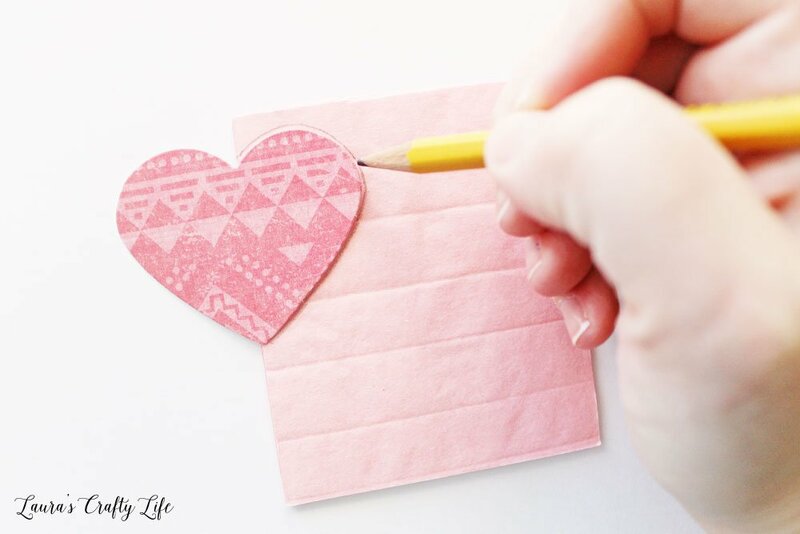 I used the heart as a guide to trace one half of a heart shape on the DIY Party pink honeycomb pad. I then drew a smaller half heart shape inside my traced heart and cut it out. 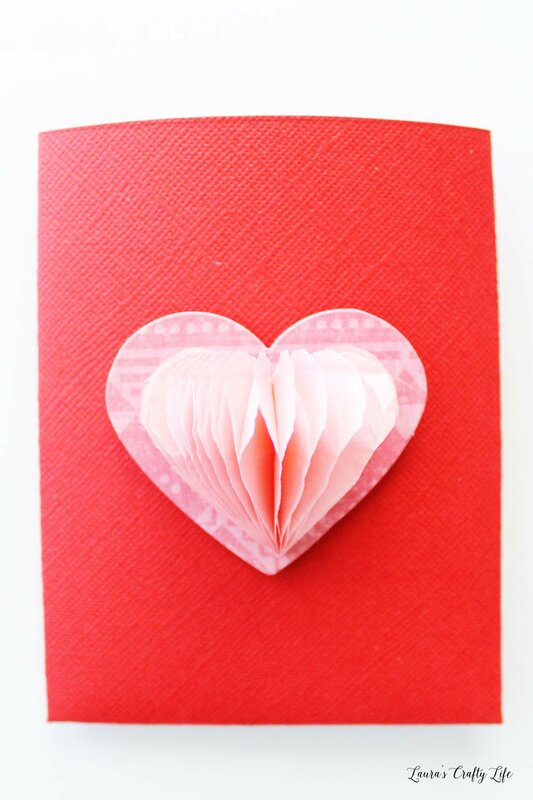 I attached the honeycomb heart to the cardstock heart and added the whole thing to the favor envelope using an adhesive square. 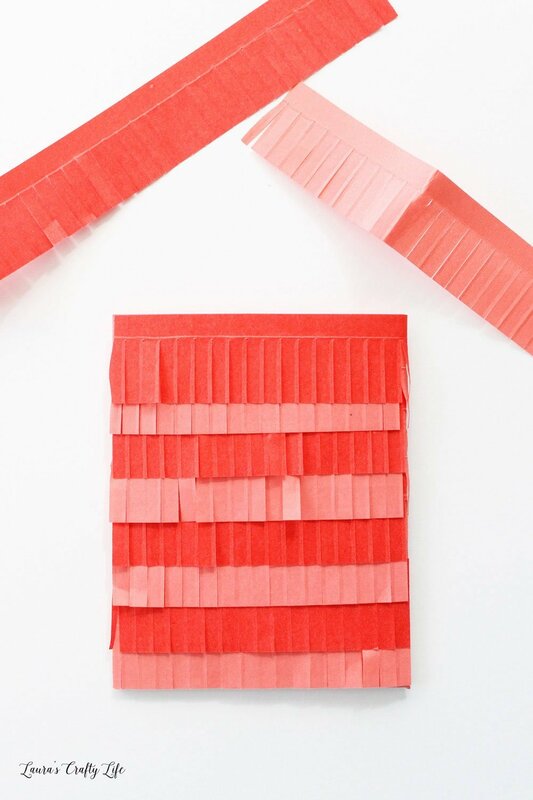 For the second style of envelope, I added alternating colors of pink and red fringe tape to the front of my envelope. 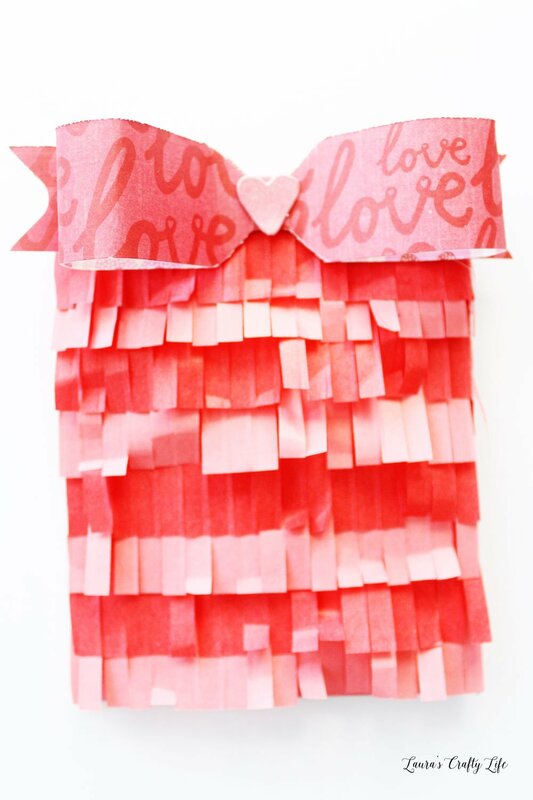 The fringe tape by itself looked very cute but I wanted to add a little something extra to the top, so I created a small size bow using the 1-2-3 punch board and some “love” paper from the Crush collection. 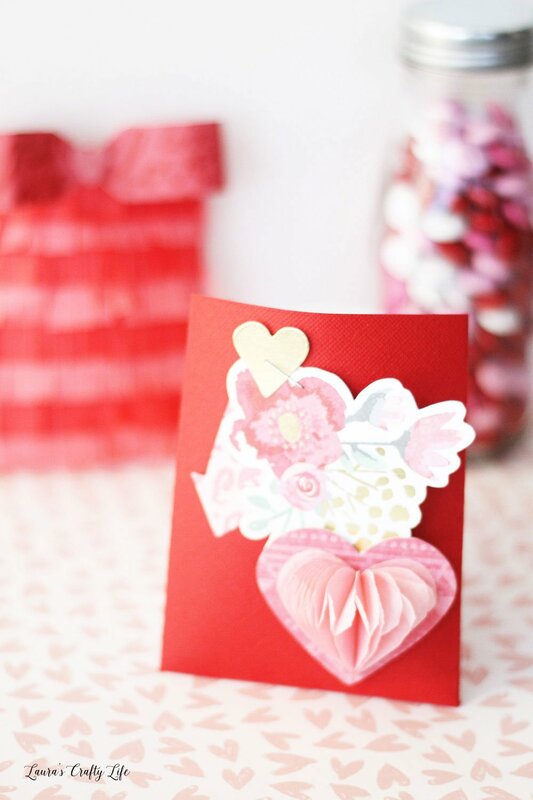 I attached the bow to the top of the envelope and added a little pink cardstock heart to the middle. These party favors are ready for adding some special treats to. You definitely can’t go wrong with chocolate!